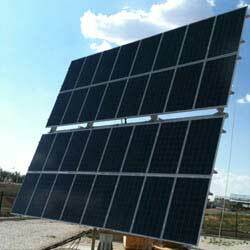 TEP Two-Axis Solar Power Pole equipment pre-engineered for ease of installation and scalability. The Two-Axis Solar Power Pole has been optimized for easy integration on to electric utility grid. The Two-Axis Solar Power Pole has designed with all components matched for high-performance in large-scale applications. The Two-Axis Solar Power Pole has a standardized 7m x 8m layout and includes solar modules, inverters, communications (RS485), earth ground, DC collection wiring and equipment, weather data collection sensors, assembly and reference installation documentation.